Vbeam®can do it all: from rejuvenation by correcting red and brown skin discoloration, to eliminating virtually all vascular and pigmented lesions. The Perfecta features advanced micro-pulse technology, multiple handpieces for treating various spot sizes, and our patented Dynamic Cooling Device™ (DCD™) cooling system, which all but eliminates patient downtime by preventing purpura, or bruising. Candela’s patented Dynamic Cooling Device™ (DCD™) provides consistent, reproducible epidermal cooling and unparalleled comfort for your patients. 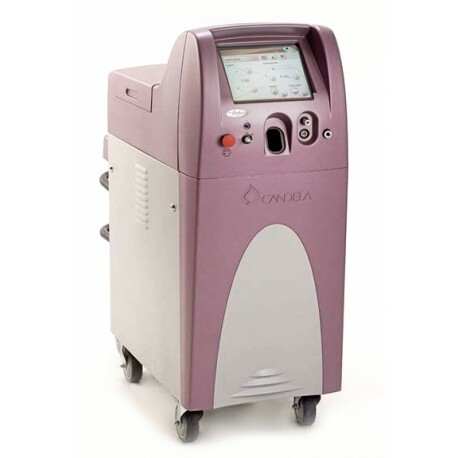 DCD™ prepares skin for treatment by selectively spraying the upper layers with a cooling burst of cryogen in adjustable spray/delay durations, milliseconds before and after the laser pulse. DCD’s unique design provides excellent visibility throughout the entire process. DCD™ is operator technique independent-it will provide the same epidermal protection no matter how fast the laser is fired. The more patients you see and treat optimally, the more profitable for you practice. Vbeam can do it all; from treating challenging vascular lesions like PWS, Telangiectasia and diffuse redness to eliminating epidermal pigmented lesions like age spots, to treating periorbital wrinkles – and do it all Purpura Free! Superior results treating the broadest range of the most challenging vascular lesions such as: Leg Veins, Acne, Port Wine Stains, Angioma and Hemangioma. Our unique micro-pulse technology provides gentle vessel heating, allowing effective and consistent results for your patients without any downtime. Total Support Perfecta PDL includes the largest selection of spot sizes in the industry. Includes everything you need to get started from self–calibrating SMART™ distance gauges, to the only integrated cooling system in the industry DCD™. Practice marketing support and free Website builder also included. Our 10” color user interface screen provides pre-set treatment guidelines with a touch to provide safe starting points for patient treatment. Perfecta selects fluence, pulse width and DCD™ cooling parameters based on the indication and spot size you choose.